Left over Jacket Potatoes from the day before chilled in the fridge (easier to slice nicely). 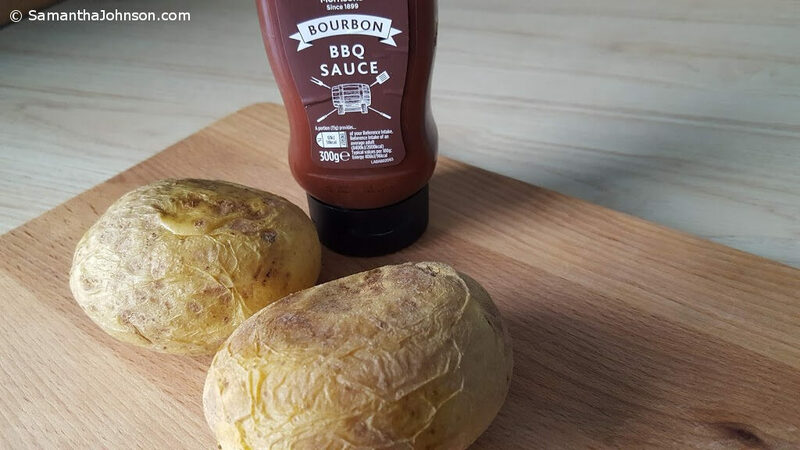 Low Fat or Fat free BBQ Sauce (you use very little). Carefully slice the potatoes lengthwise (you can cut across but they are less attractive and harder to hold and more likely to break up). Get a piece of Kitchen paper, a non stick pan and extra virgin olive oil. Drizzle some olive oil into the pan. Heat pan and then wipe around the pan with the kitchen paper, just be careful not to burn yourself. 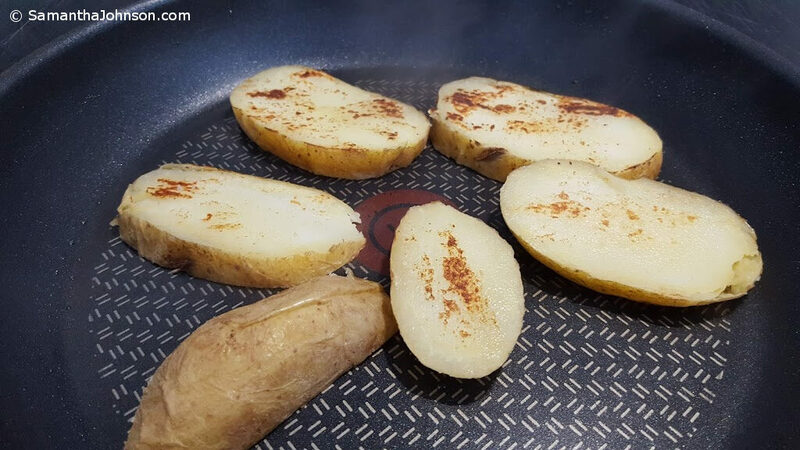 This creates a very thin coating enough so potatoes do not stick and gives them a slight olive oil aroma with next to no oil used. Carefully place the potato pieces into the pan and leave on medium setting until the ‘catch’ (as in they brown or blacken in places approx 3 mins per side) do not press on the potatoes as they will fall apart and are more likely to stick. Flip them and cook the other side for about 3 mins (dependent on your heat setting). Remove them using a flat plastic fish slice spatula to not only protect your pan from scratches but also so they are well supported. 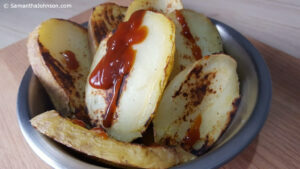 Arrange in a bowl sprinkle with salt and (optional) drizzle with BBQ sauce (approx half a teaspoon or thereabouts). But ready salted slices without the dressing make a great substitute for crisps. « Potato Diet Recipes – Sliced Sweet Potato Jackets with Sour Cream.